History: Abraham Cornelius has been a major figure in the shady world of black projects for the better part of a century. Much of his life and work has stemmed from secret research done on behalf of government and military programs. It was not by accident. Conrelius set out on this path long before these programs began. Originally born in Winnipeg, Canada to a couple of doctors, Abraham Cornelius acquired an early interest in science. His father was already doing research in medicine for the Canadian military throughout his early life and while none of it was of a secretive nature, it showed young Abraham that the military was the place to be if he wanted all the right tools. Under the tuteledge of his father, young Abraham quickly became a science prodigy and skipped several grades while in school. But just as he was preparing to enter his father's world, he and his mother unexpectedly fell ill with cancer. For a full year, Conrelius had to put off his studies and take care of his parents. He had to watch as they weakened substantially from their condition. Some of his father's research had been in advanced healing and it was from that research that Cornelius tried to extract a treatment. It was no use. Both his parents died within months of each other. Before the death of his father though, he compiled every scrap of his work both private and military. This work would be the beginning of Cornelius's lifelong obsession. In many ways it helped mitigate the loss of his parents. He mourned only briefly before going back to his studies. Armed with his father's research and brilliance, Cornelius breezed through the University of Winnipeg with a degree in biology. He went onto study advanced courses at UC Berkley and Columbia where he gained more degrees in the field of genetics and physiology. At around this time he also became a primary voice in the emerging research of human mutation. At the time the mutant population was just starting to grow. Since it was so poorly understood, few researchers had the resources or the know-how to study it. Cornelius was in a prime position to get in on the ground floor of this research and thanks to some of the research from his father, he became one of the first few experts on the subject. He led the charge in various academic circles to uncover the mysterious X-gene and work out it's many mysteries. For years his research was the base from which most mutant knowledge stemmed. Because of his expertise, it did not take long for him to find his way back to the military. Dr. Abraham Cornelius was recruited by both American and Canadian officials looking to fund his work for the purpose of making weapons. It was a task Cornelius eagerly embraced. Since so much of his father's work had been on the nature of healing and the manipulation of physiology, the creation of a weapon was right up his alley. He gave up several lucrative teaching positions to dedicate his life to the military like his father. From here, much of his work gets very sketchy. It is uncertain where and how Conrnelius continues his work. All that is known is he managed to produce enough results to grant him his own program that was to be jointly funded by the American and Canadian militaries. This is when he crosses paths with then Major Johnathan Wraith. He's the one who helps him organize his resources and put together the program that would become Weapon X. It is in this program that much of his work came together. The healing powers of men like Logan and Victor Creed were the cornerstone of Cornelius's research. From them he was able to create the many processes that would define Weapon X. However, these processes were imperfect and as a result, the first attempt at Weapon X turned into a bloody failure. While Cornelius and Wraith survived, many did not and this set Cornelius back many years. The faliure of Weapon X affected him deeply. It did not hurt his resolve. If anything, it strengthened it. He became more determined and obsessed to finish what he started. He became so obsessed that some in the military worried of his mental health. Whatever the concerns, they were not enough to end his research. America and Canada kept him on the payroll, but on a much shorter leash. It is around this time Cornelius began making shady deals to aid in his work. The nature of these deals are not known, but it is suspected he cooperated with very unfriendly figures both in other militaries and in secretive non-government entities. Whatever the dealings, they helped him stay on board and eventually he was given a second chance with Weapon X. The second time around the experiment with Wolverine was a success. Cornelius's work was finaly realized. He proved to everyone in the military that a mutant could be controlled and manipulated into the perfect killing machine. It immediately earned him respect and acclaim from officials everywhere in the world of black ops. However, it was not to last. Wolverine escaped again by means that are not entirely clear. Cornelius was not said to be at fault this time, but he did take it personally and he became even more obsessed afterward. At this point the government cuts most of it's ties to Weapon X and Cornelius is offered a chance to leave. He refuses and with General Wraith, he continues his work on a much more shady level. Everything after the second failure of Weapon X is a mystery. Abraham Cornelius remains driven if not obsessed with completing Weapon X. The details still are not clear. Whatever the case, his reasons have not changed. 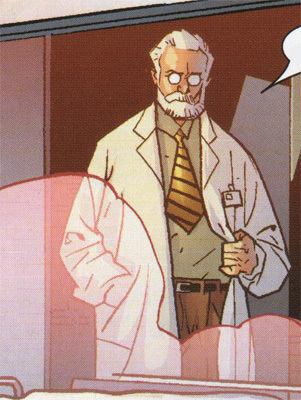 He remains intent on finishing his research and he is unwilling to let anyone, including the X-men, get in his way. Character Breakdown: Abraham Cornelius has a very obsessive personality. He's focused on his goals almost to an unhealthy degree. He makes little effort to add balance to his life and seems perfectly content dedicating much of his energy towards his research. He's so dedicated he has no room for family, friends, or forging new relationships. This makes him socially awkward and adverse to dissenting views. There is nobody close to him that he trusts or cares for enough to listen to. His entire focus is figuring out whether or not he can do something and not whether or not he should do something. Because of this he has very poor ethics both in his research and towards others as well. While his obsessive personality came long before his family, it is almost certain that family events played a role in forging his psychology. His father brought him into the world of science and his research became a guiding force in his later work. What appeared to have an equally strong impact was the health issues his mother and father endured. He had to watch them weaken and whither. Cancer is a failure of one's own biology and seeing this, the importance of Cornelius's research is only further reinforced. In that sense he doesn't mourn the death of his parents as most pepole would. In a way their death becomes a factor in his research. It makes his approach all the more impersonal, thus adding to his loose ethics. A lack of emotion coupled with a growing obsession further hinders his ability to forge relationships. This helps make him more of a reculse and sets the tone for how he conducts himself through the rest of his life. Between his obsession and his lack of ethics, he fits the mold of Weapon X perfectly. His willingness to ignore ethics and treat others with such inhuamnity equip him with the mindset and determination he needs to carry out this project. What really pushes him closer to the edge are the failures to complete what he began with Logan and Victor Creed. Failure to someone as obsessed as him only further enrages the psyche and the more roadblocks he encounters, the more frustrated he becomes. Yet rather than abandon the research, he focuses even harder. It makes him willing to deal with people he probably shouldn't deal with and further isolates him from even those who work closely with him. So long as his research is incomplete, he will continue to obsess and it remains to be seen just how detrimental that could be to him and those who cross his path.